Yeah, I know, I promised you other New York things. And you believed me? That was just silly. It's still coming, but I'm trying to get my photos off my phone and into a more usable spot, and in the meantime it's always a good day for more Les Misérables. Yes, believe it or not, I left things out yesterday and still have more to say. Incidentally, the people next to us in the theatre had tickets for Saturday's show without knowing anything about the cast, they didn't know Ramin is leaving soon and Alfie Boe is joining the cast--they just love Les Misérables and were able to enjoy the show without all the obsessive whatever it is that I do. 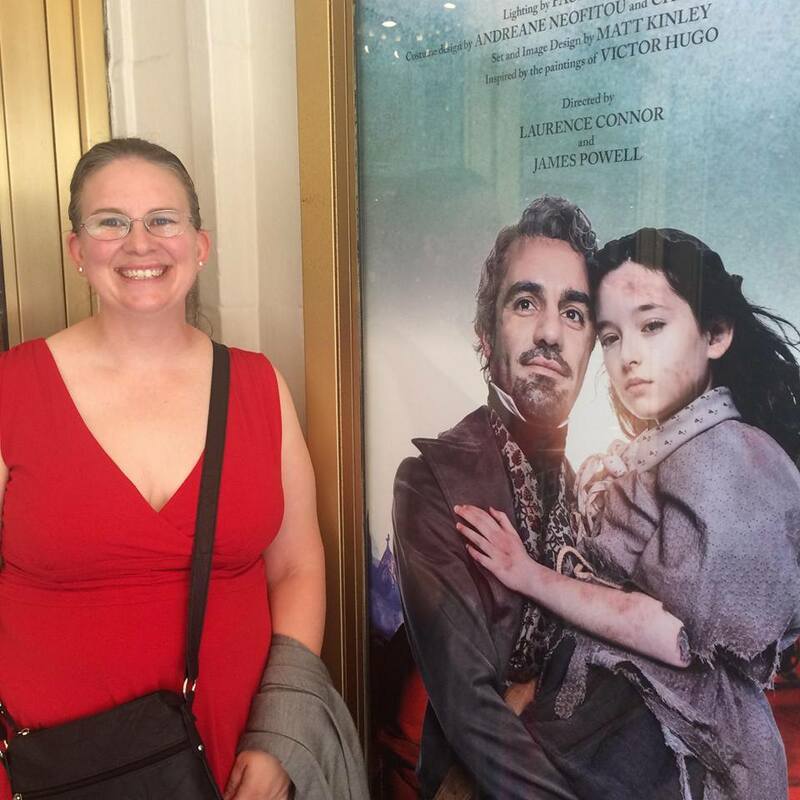 While we were chatting, the guy said, "I really wasn't expecting to see a 30-year-old playing Valjean," and it took everything in me not to correct him with Ramin's actual age. (I swear, I only know it because he and I were born in the same year. 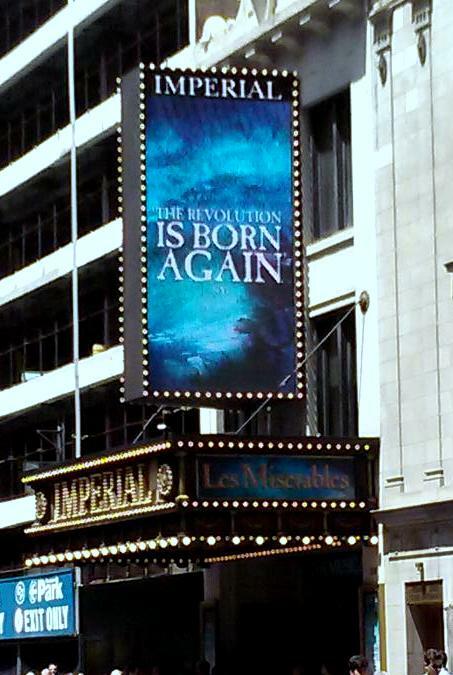 I've no idea how old anyone else on Broadway is.) (Except Kyle Jean-Baptiste, but that's because it's been in the news for a couple days. I'll forget soon.) Instead, I just agreed that Ramin is young and we moved on to talking about other stuff. 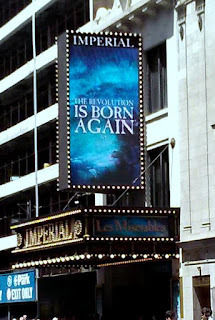 After the 25th anniversary of Les Mis in 2010, the show has been re-orchestrated, re-imagined, and re-whatevered so that there are significant differences from what the show is now versus what it was the first couple of times I saw it--the characteristic turntable, for example, is gone. (See more changes through the years in this article.) I noticed the Broadway version also has a couple lines from the 2012 movie that I've never heard on stage before. Every show is in a constant state of tweaking, obviously, because that's how you get an amazing product night after night-- by refining what's not working, changing things as needed, etc. But the changes as the show gets older are one reason I keep going back to see it every couple of years--it's literally never been the same show twice. And with that, I really am done. Other New York adventures still coming, once my phone starts to cooperate. This post is going to be long. Here's the short version: I went to see Les Misérables on Broadway over the weekend, was completely blown away, as I so often am, and am now here to tell you about it. Feel free to skip to the end if you're not into the details, of which there are many. Earl Carpenter (Javert): I had already bought our tickets before he joined the cast, but was pretty excited to see him. He was one of Chadwick's favourite actors, and sometime a few weeks ago I thought, "Oh, I haven't told Chad yet that I'm going to see Earl Carpenter! Oh..." So it was special for me to see him, even though, and perhaps especially because, Chadwick couldn't. Brennyn Lark (Éponine): Holy smokes, what a gorgeous voice. 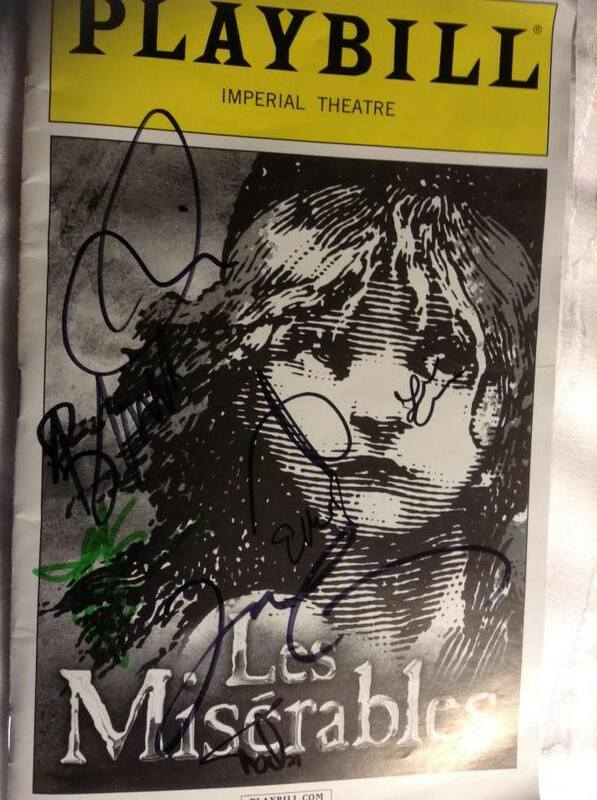 And she came to stage door, so I have her autograph on my playbill. Chris McCarrell (Marius): Early on in my Les-Mis-loving days, all I cared about was Marius and Cosette, but once I started paying attention to other characters (i.e., Enjolras), I realised that Marius can be kind of annoying, a perception that was not helped by reading the book, where he's even worse. This Marius, however, is delightful and not annoying. He sings a phenomenal "Empty Chairs at Empty Tables." 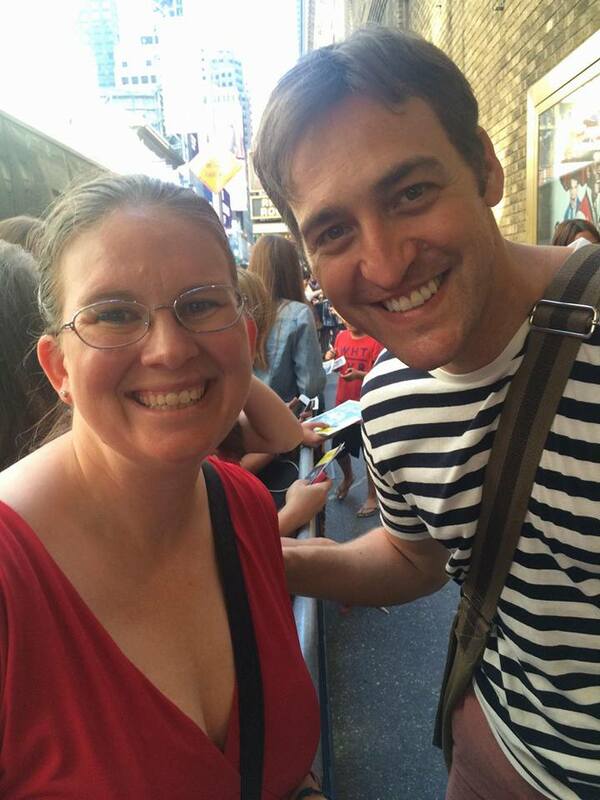 Also, he's quite possibly the prettiest Marius I've ever seen. Wallace Smith (Enjolras): Enjolras will always be my favourite. Wallace Smith has a beautiful voice, fantastic stage presence, and is altogether awesome. Anyway, after seeing some 2012 tour press and one magical cast list, I'm almost positive it's the same guy. I spent some time searching for the old playbill, with no luck, and finally had to stop to wonder why this is so important. This weekend, this experience of my first Broadway musical(s), were more things that Chadwick and I should have had together but didn't. 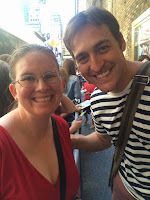 But since we were both impressed by Grantaire in 2012, if it was Joseph Spieldenner we saw together, that's one less thing he missed and one more thing we shared. And that's why it matters. It's a small thing, but I'm hanging on to small things right now. And speaking of... "Empty Chairs at Empty Tables": It was one of Chadwick's favourite songs, and that alone was enough to make me pay extra attention and already be a bit emotional before it started. At the end of "Turning," the women all left candles sitting on the stage, which had me wondering what was happening next. All the students who died on the barricade come on stage during "Empty Chairs", and each one took one of the candles and blew it out before leaving the stage again. My description can't possibly do it justice, so let's just say it's a good thing I had a hankie. It was a powerful moment. "Lovely Ladies": This has always been the saddest part of the show for me, ever since the first time the line, "Only joking, dearie knows her place," first registered in my brain during a show (it's not in the soundtrack I own). Incidentally, you know Bamatabois, the guy who gets Fantine arrested after this song? Also played by Joseph Spieldenner. I was in awe when I re-read the program and saw that-- I mean, I get that the audience isn't supposed to catch on to who all each member of the ensemble plays, but I try to keep track of them on purpose because I like being awed by the range of abilities Les Mis actors have. In this case? I did not even notice, because the characters were so different. (And Bamatabois was standing right in front of me, close enough for me to see all the blood on his face.) I'm still both blown away and heartbroken at the same time that such a captivating Grantaire is also such a vile bad guy. playbill, but no live pic. And finally... Ramin Karimloo (Jean Valjean): He's the reason I went, so naturally I was not surprised at how amazing his performance was. I saw him in concert a couple of years ago on his Broadgrass tour, which was delightful, but seeing him live and in character is something else altogether. Three hours is just not long enough, which is probably why I've spent the last three days in a fog thinking about this show. I'm definitely grabbing any chance I get to see him live again. So, if you're still with me, you deserve a medal! Unfortunately, Thénardier stole them all. 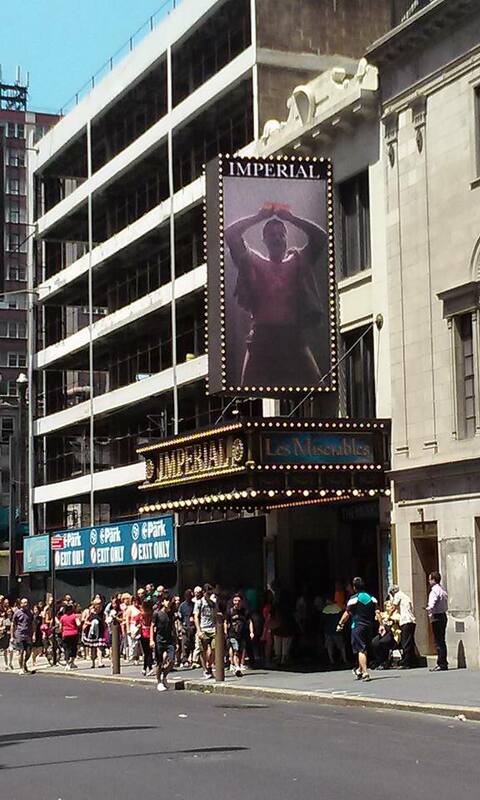 Anyway, that was my experience at Les Misérables on Broadway. Totally worth it, and I would do it again in a heartbeat. And since Jenni asked so nicely, other highlights of my New York trip are coming soon. I did see a few things in between trips to the theatre. 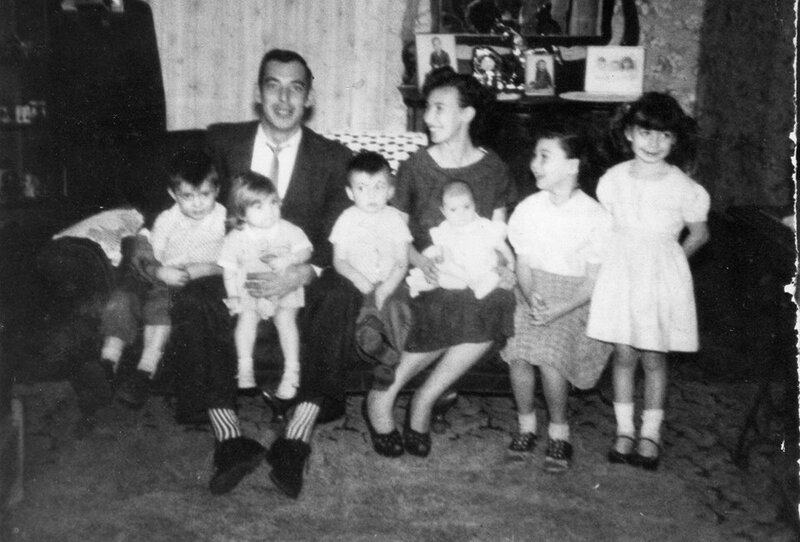 I don't know if I ever mentioned this on the blog, but my paternal grandmother passed away two weeks before Chadwick did. Denise & I made a mad dash up to Indiana when the docs said she had less than a week left, only to arrive a few hours too late to see her alive. Of course, we knew when we saw her last September that we were probably saying good-bye, and that this is one of the life choices we made when we decided that a couple states' distance never hurt anybody, but that doesn't make it any easier. But of course, that loss was overshadowed by the much closer and much less expected loss a couple of weeks later, so much so that I have a hard time remembering that she's gone. When I ordered Mother's Day flowers this year, I was halfway through typing in her address before I remembered that no one was there to receive them. I've lost count of how many times I've thought about calling her, only to realise that hers is one of the phantom numbers in my phone. And, just this week, I've started dreaming about her again. I've started dreaming about Chadwick, too, which has led to a bout of not wanting to get out of bed in the morning. I only see him when I'm sleeping, I can only talk to him then-- or rather, that's the only time he can answer me. And that being the case, why on earth would I ever want to wake up? I'm not really surprised I'd start dreaming about Grandma and Chadwick at about the same time, considering how close together their deaths were. My grandmother and I don't really talk in my dreams; she's just there, the same presence she's been all my life. The reality that I'll never again open my mailbox and find one of her letters is starting to settle over me. Even into her 80s, she had beautiful handwriting, the kind that's so pretty it's almost unreadable. :) Even into her 80s, she wrote long letters full of the kind of insider information about various family members that none of them would ever tell me themselves. Now my only news source is what they're willing to tell me on Facebook. No dreams can bring back what we've lost. I'm 14 hours into Camp NaNoWriMo and I still haven't decided what I'm writing. Thank goodness for the variable word count goals during Camp NaNo. Missing a couple days won't hurt too much! I just dug this up off my blog archives. I can't narrow it down in Google images. At least there's a copyright on it. My real reason to post today, though, isn't to be frantic about Camp NaNo. 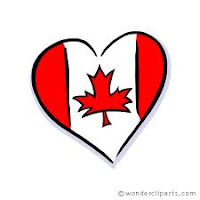 Rather, I'm here to say HAPPY CANADA DAY!! to all my bloggy friends from the north. I hope you're having a fantastic holiday. If you're Canadian and Camp NaNo-ing, then may your celebrations inspire you to write like you've never written before. So, my narrowed-down choices for Camp NaNo? Either carry on with my thing about a professional knitter that I abandoned during NaNoWriMo last year, or pick up my favourite set of characters who will never see the light of day but who are so much fun to write and see what I can do with them. I may have to flip a coin.